"Yoga Ratnakara" is the 'A to Z' book on Ayurveda, it contains all the essential features related to Ayurveda concepts, practices, procedures, and above all it is enriched with the highly effective and result-oriented medicinal formulations, popularly called as 'Yogas' for various diseases from fever to stroke. Certain formulations described in the text have been subjected to clinical research in various research and post-graduate centers in India and these research studies 'Endorsed' their efficacy even in present day conditions. These positive inputs inspired us to undertake the English translation of this great classic from Sanskrit. Yoga Ratnakara represents the various shades of Ancient Medical Wisdom/knowledge embedded in books of Ancient times to the later part of the 17th century this makes it an unique book on Ayurvedic medicine. This English version is being presented in 2 Volumes, with suitable notes, indexes etc. keeping in view the needs of the present day doctors, Scholars and Researchers etc. In Cryptic sense - 'Yoga Ratnakara' as the title suggests in really a treasure book of gem-like medicinal recipes and formulations for the practitioners of Ayurveda, and research scholars. Dr. S. Suresh Babu, M.D. (Ayu.) is a well-known Figure, who won many prizes at national level and awards at State Level, Recently he has been honoured with Best Teacher Award for the year 2002 by the Chief Minister of A.P. at a function held on 05-09-2002. He is a renowned writer for the cause of Ayurveda for more than two teaching and writing for the cause of Ayurveda for more than two Decades. Owing to a rare combination of Innovation and sound practicality, he continues to be a much sought after Doctor, Writer and Teacher in the Ayurvedic world. So for he has published about ten books on various subjects of Ayurvedic Medicine. Broadly, We comes-across three kinds of classical texts in Ayurvedic literature, One named after the original author like' Susruta samhita', second type are those popular by the name of it's redactor or samskara karta like 'Caraka Samhita', and the third type of classics are those, whose authorship is unknown or controversial. Yogaratnakara an encyclopedia of Ayurveda belongs to this rare and distinct group, as the composer of this great classic has not left any clues that could 'reveal' his identity, nowhere in the entire text, spread over two volumes (purva and uttara khanda). There are no such references either in the beginning of the text or at the end of purvardha or at the beginning of uttarardha or at the end of it, generally in such contexts, our ancient authors revealed the name, place/country, to which they belonged along with their father's name etc. this was the established ancient method usually followed by the authors. Unfortunately in the case of 'Yogaratnakara' all these clues, pointers about authorship are missing, leaving much scope for speculation on this aspect and I feel it is wiser to leave this issue to the historical researchers. A chain of books on Ayurveda therapeutics started with 'Siddhayoga' also known as 'Vrndamadhava' by Vrnda in 9th Century AD and followed by a series of books like 'Cakradatta' 11th Century AD; 'Gada Nigraha' 12th Century AD; 'Sarangadhara samhita' 13th Century AD, 'Bhavaprakasa' 16th Century AD; Yogarantnakara and Bhaisajyaratnavali in 18th Century AD. 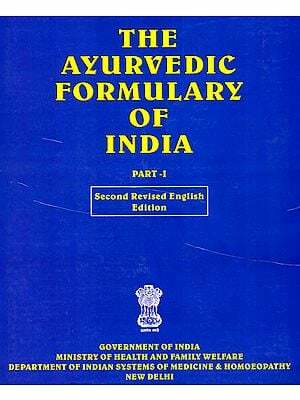 These books incorporated many new concepts, thoughts and therapeutics and further enriched ayurveda as results of exchange and sharings of different medical thoughts, entered into India along with foreign rulers like Muslim, British, Portuguese and Dutch Kings, who ruled India during this long span of time i.e. 16th to 18th Centuries. Thus Yogaratnakara, reflects the various shades of therapeutics prevailed during the 16th to 18th Centuries, a period considered as an epoch of the development of medieval art, culture and science. The great exchange with Mughals and Western races, enabled in synthesizing the principles of both art, science and moulding them in tune with the needs of time and as a consequence, various new concepts as well as description about new/unknown diseases, drugs etc. were incorporated into Ayurveda, best examples of this new additions are Nadi Pariksa (Pulse study), Snayuka (a kind of worm causing disease in human body), Epidemic Seetala (resembling small pox), and 'somaroga' etc. 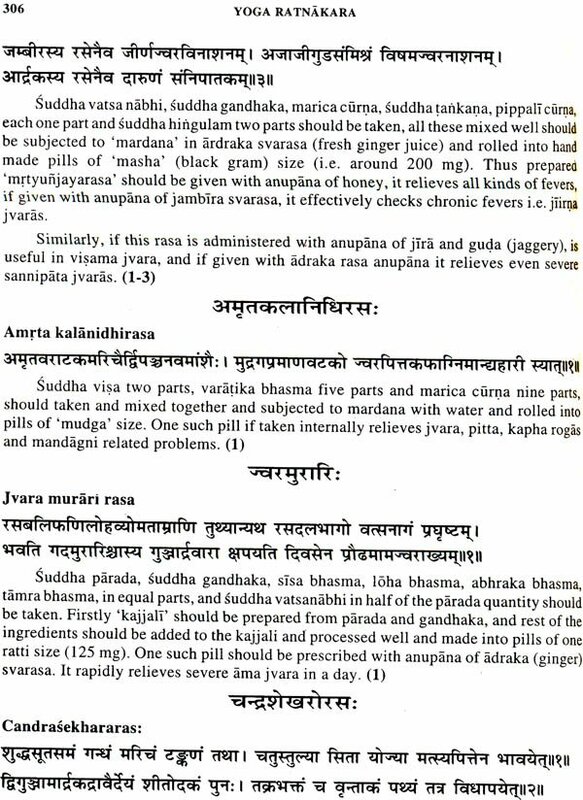 Yogaratnakara was compiled before 'Bhaisajyaratnavali' and its source material Based on forty two (42) books on Ayurveda, available at that point 01 time, right from Susruta to Bhavaprakasa. Apart from these, certain new drugs were also introduced for first time like Tobacco, Bhimaseni Karpura and food beverages like Sara, Angavika, Panaka etc. all these makes this classic as an unique book on Ayurvedic practices and formulations, many of the formulations mentioned in this work, have been tried under various clinical research programmes as a part of post-graduate education and research at our kaya cikitsa post-graduate centre, DR BRKR Govt Ayurvedic College, Hyderabad, affiliated to NTR University of Health-Sciences (AP), and found to be very effective in various clinical conditions. This prompted me to take-up this task of English translation of Yogaratnakara, as there is no English edition is available, so as to make it available globally. "Yogaratnakra" as title itself reveals is a treasure book of gem like medicinal formulations, which still remained unexplored. I hope, that this English edition will become a new source book for further clinical and research initiatives. 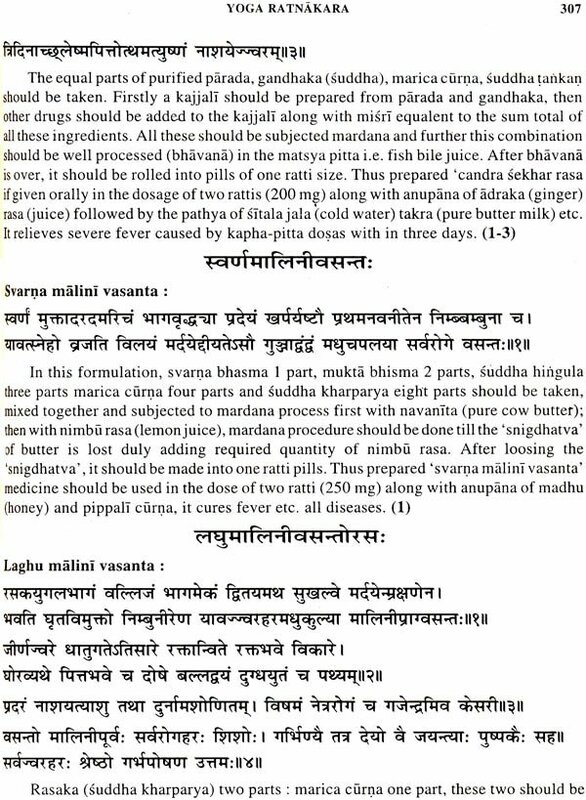 And I invite the suggestions, comments from the learned Scholars of Ayurveda and modern medicine on this work, so that I can further improve the content in future editions. Finally there are many people who stood behind me in completing this task. Sri Brij Mohan Das Gupta, Kamlesh Gupta and Sachin Gupta of Mis Chowkhamba Sanskrit Series Office, Varanasi, who have encouraged me to take up this work and made me to complete it through constant reminders, I am very thankful to them for the offer and follow-up similarly Dr. Pavan MD (Dravyaguna), Dr. Durgeswari MD (Kaya Cikitsa) helped a lot in writing as well in proof-readings, my heartfelt thanks to them. And I am also thankful to many others, who might have helped me indirectly or unknowingly for their unvisible cooperation.